The Atlantic Division first place New York Rangers dropped a bomb on the fans tonight at MSG as they were shutout by Carolina Hurricanes' goalkeeper Cam Ward, 4-0. Our "Hyde Blueshirts" showed up this evening, the coach wasn't present and once again the All-Stars this time left the rookies to arrive on ice and play a poor game of hockey. Here is an official recap because I don't have the patience to cover the basics after sitting next to my 'Canes-fan-friend through this tragedy at The Garden. Where to begin? The guy next to me halfway through the second period screamed "THROW YOUR PURSE AT HIM, MALIK!!!!" which, somewhat, explains where the evening began. Not that Malik was responsible for the loss tonight - he wasn't, but the skating two-by-four (a.k.a. "Lurch") was non-present and looked bored and/or injured. Just as we witnessed in Ottawa on Saturday, Malik mishandled the puck everytime he was near it, a scared girl terrified of analyzing where he might pass it, but instead choosing to hit it as hard as he can just to clear it. I blame Marek Malik for setting the tone. Get him off my team. His first fumble led to a turnover of the night and the first Carolina goal on Henrik Lunqvist - an unstoppable goal. The second goal on NYR, on a defensive turnover, could not have been stopped. The first period showed a complete breakdown of the system, no leadership, players not communicating to each other, non-present veterans, newbies turning over pivotal plays and no coaching. A really bad game overall. The last Carolina goal is symbolic of our Blueshirt team philosophy, one that continues to be built around Jaromir Jagr. One example of this came toward the end of a shift in the third period when the Rangers were down 3-0, Jagr set up a play and broke his stick. Unable to continue playing as the point person on the shift, the entire Ranger defense line froze - youth unable to comprehend what to do next - and the undefended loose puck, frozen in time, sat for David Tanabe at his own blueline to carry it forward to score on Henrik Lunqvist to finally end the hope. Jagr, Shanny, Gomez & Drury were once again invisble. They must have read in the papers and The Dark Ranger's blog how they are finally getting it together and the chemistry they have been seeking all season has arrived at last. Not even a point tonight and I doubt there were even any valuable fantasy hockey pool PIMs or PPPs to count on.... Not even Colton Orr or Ryan Hollweg dropped a glove. A boring loss at that. Well done, as usual, TDR. I mentioned at the Dallas game that it was time for Renney to start throwing chairs and asserting himself before this ship sinks. Now more than ever is his presence needed. I am a huge Renney supporter but if he's not willing to get aggressive, it may be time for a Keenan-esque coach. Thanks ak...I want to support Renney. I really do. Again as we've all stated, it's difficult to condemn a coach when you're in first place in the division (that never stopped Lou across the Hudson) but anyone, including management, can see that he is not providing the much needed motivation in the locker room. 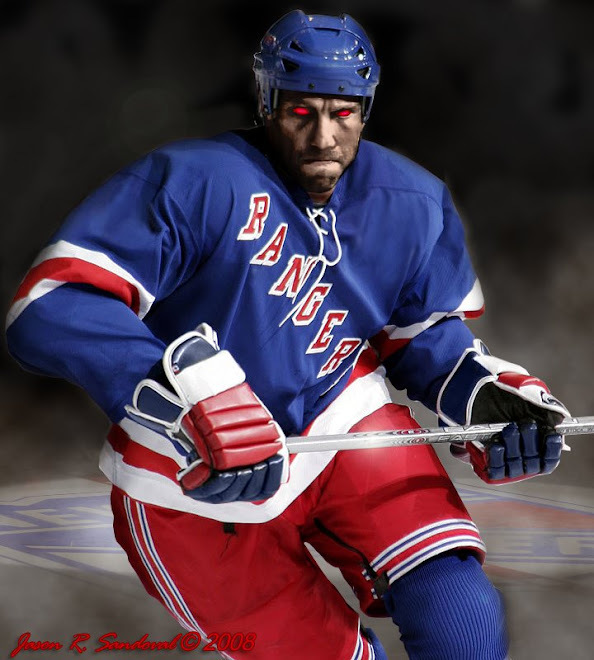 Bring Keenan on...bring Nolen in....bring Hitchcock.... We've seen the "Jeckyl Blueshirts" and they are marvelous. The potential has to be maintained - and it ends with the coach. Basics. Remarkably, the only winners this week in the Atlantic were the last place Penguins...everyone is so close in points - and evenly matched. faux...i guess every team gives one of these games away now and then...last night was just 'plain bad'...and Shanny, Jagr and Drury in the papers today admitted so. I wish Renney would step up and take some responsibility. I, like you had to watch that disgrace of a performance from the stands at Madison Square Garden. Definitely my worst experience at the Garden in a while... the team was flat... the fans were flat... the beer was... well atleast the beer wasn't flat because thats all that kept me through it. Nothing more tragic than a goaless game for the Blueshirts at MSG. From now forward I promise to be a cynic. Dark Ranger, it was about as bad a game I have ever seen and trust me I've seen some doozies. When the team comes out the way they did for a showdown game against a division leader there is only one place to put the finger of blame and that is on the coach. Coach clueless can't get a team up for a big game and is as bad an in game coach as there is in the business. Unfortunately, with the Stealth GM and the ignorant Dolan there is no hope of a coach change. Hence, someone on the team has to step up and take over ala Mark Messier. Jagr doesn't have it in his genes and Shanahan is too old to do it. We may need a blockbuster deal to get a guy like Lecavalier from Tampa. Otherwise, we are going to do this ranting all year long.